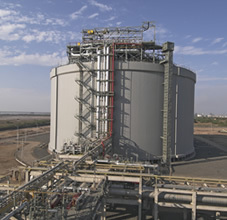 We have a long legacy of experience in the design and construction of Cryogenic Storage Tanks which dates back to 1972, when we executed our first EPC contract for a 1000 Mt. LOX Tank for a Steel Plant in Eastern India. Our references have since grown to include more than 50 Low Temperature and Cryogenic Tanks designed to the API 620 & BS 7777 Code Standards for domestic & international customers. We are amongst a handful of global players who can offer cryogenic storage solutions for the entire range of service applications, from VCM / Ammonia / LPG to Ethylene / LoX / LNG. Our experience encompasses the entire range of cryogenic containment options, configurations & metallurgies, including Low Temperature Carbon Steel, Aluminum Alloy Steel, Stainless Steel and 9% Nickel Steel. We provide complete Cryogenic Storage System Solutions that encompass Receipt, Storage, Handling, Refrigeration and Vaporizing Facilities. 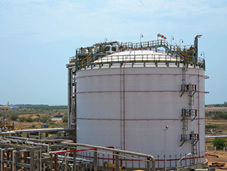 We have built India’s first LNG Storage Tanks and a majority of India’s Ethylene Storage Tanks. As a full scale EPC service provider in this segment with in-house capabilities, we bring to the table an established array of experience in Cryogenic Storage Systems.